In this sophisticated threat environment,traditional security tactics are failing. Symantec encourages organizations to revisit their security posture to build a more cyber resilient enterprise. Resilience is not defined by a series of checklists, but through evaluations based on the current threat environment and the acceptable risk level for the organization. 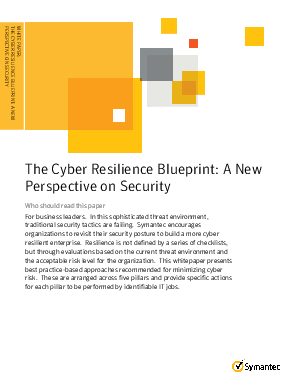 This whitepaper presents best practice-based approaches recommended for minimizing cyber risk. These are arranged across five pillars and provide specific actions for each pillar to be performed by identifiable IT jobs.